The artichoke was something I avoided as a child. I actually did not mind peeling off the leaves and scraping them off with my teeth. But when I arrived at that hairy center, I was repulsed and would not cut out and eat the artichoke heart. My siblings were thrilled and would argue over who got to eat it! They were happy to eat it without all the work of peeling off the leaves. Our verse for today is a commandment often repeated in the Old Testament. It is repeated in the New Testament as well. The Lord wants us to love Him with all our heart. He wants our entire being to respond to Him. Half measures do not mean so much. A divided heart does not have as much value to Him. He gives His all to us and the only possible response is to give our all to Him in return. My problem is that I think I am giving Him my heart when perhaps I have only given Him a part. Being humbled and tested is the only way I can really know if I have given Him all my heart. The Lord led the Israelites in the wilderness for 40 years in order to know what was in their hearts (Deut. 8:2). My difficulties today serve the same purpose. Each problem peels off another outside leaf and the heart is more and more exposed. It is in the midst of suffering or loss that my heart is revealed. Will I only love Him when times are good? Do I only love Him when my desires are met? Lord, may my heart be completely Yours today. Categories: For Foodies, Suffering and Trials | Permalink. Meet Roxanne, the African Spotted leopard. 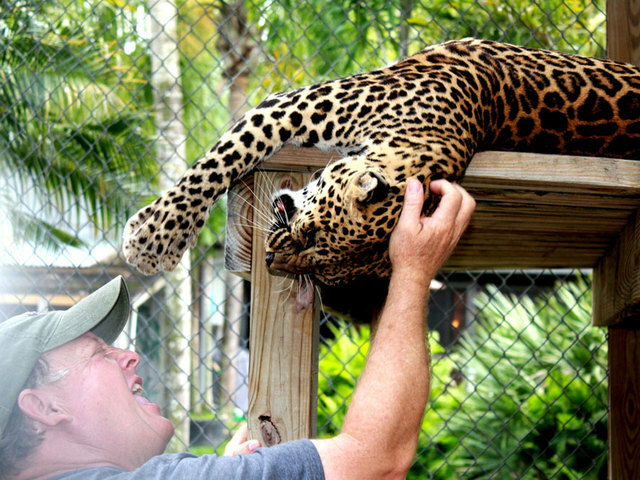 She held the record as the oldest spotted leopard living in captivity; 24 years plus. She looks quite tame in this image but I am not so sure I would trust her not to harm me. Perhaps, supervised and with a competent trainer, I would risk a quick cuddle but nothing more. She is after all still a leopard with her God-given instincts still intact, though they be buried under years of pampered care and gentle handling. Our verse for today has become a well-known proverb in our day. A leopard cannot change its spots. A person cannot change his essential nature. The idea is the same in the expression, “A tiger cannot change its stripes.” Our verse goes on to say that an evil person cannot change who he is by doing good. Without the Lord, every good act is regarded as a filthy rag in His eyes (Isaiah 64:6). A person can look good with the right image. He can live a life doing good things. But until the heart is changed from its essential nature, it is all window dressing! How hopeless this sounds until I realize the change God creates for those who place their trust in Him. He radically changes my heart. He does not just reform me but makes me a completely new creation! (II Cor. 5:17) Now, the good things I do for His glory are truly good, flowing from a changed heart. No, I cannot change my “spots” but I am eternally thankful that He has! I am grateful that You Lord, create true change! 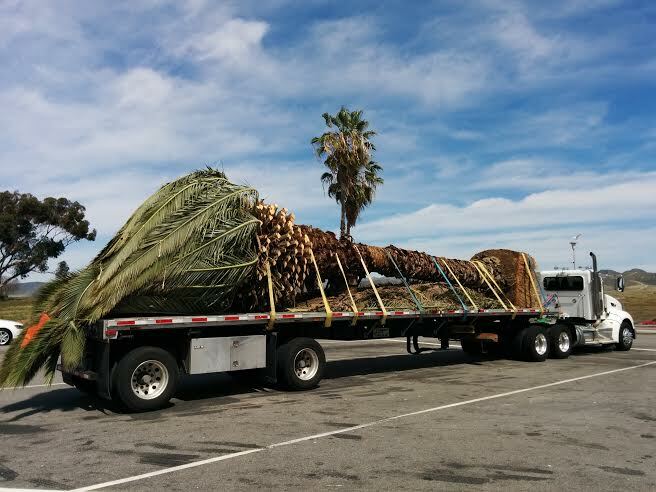 I thought it odd to see this huge palm tree being trucked to a different home. The new owners must have gone to quite a bit of trouble and cost to transplant such a huge tree. The driver told us that the price tag to move and transplant it was $1,000! How awful if this majestic tree were to fail to take root in its new home. Our verse for today describes how as believers we are rooted in a different soil. No longer are we in the soil of the world, but we have been transplanted. Those who have received Christ as Lord and Master live their lives for Him. Being rooted and built up in Him means that faith is continually strengthened as we learn and grow. Being transplanted from the world into Him is made evident by our thankful spirit. The Lord has gone to enormous lengths to transplant us. He has sacrificed Himself and bought us at a great price (I Cor. 6:20). He has taken us out of the darkness and transplanted us in the light (Eph. 5:8). He has given us everything that is needed to live a godly life in Him (II Peter 1:3). Like the Israelites who longed to return to Egypt when the going got tough, so I sometimes feel that life would be easier in the world’s soil. Instead of being thankful for the amazing new place He has planted me, I sometimes look back over my shoulder to what I have left. Thank you Lord, for transplanting me in You! Grow my roots deeper and deeper into Your incredible love. Categories: Contentment, Faith and Trust, Tree Images | Permalink. Today everyone wants to be Irish! There are parades and celebrations everywhere this week marking Saint Patrick’s Day. This patron saint of Ireland is often depicted holding a green shamrock. It is said that he used it as a visual aid to teach on the Trinity. 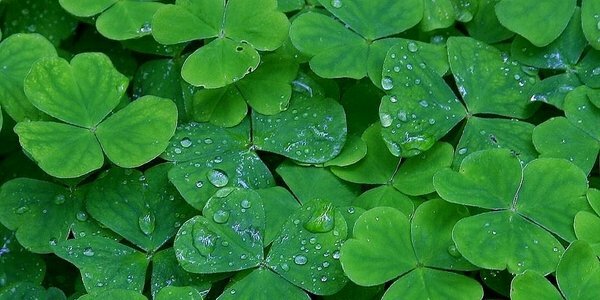 But since the holiday has moved away from any religious associations, the green shamrock is now touted to be good luck and the day sees many of us wearing green. Our verse for today gives us another reflection when thinking of the color green. Green is the color for growth and health. Those who thrive with the color green are those who make the Lord the focus of their trust. It is not the green of money that is the object of our confidence. We are not green and healthy because we have a healthy bank account balance. We thrive and grow when we lean and rely on the Lord Himself. When I look to my own resources, my color turns to a sickly brown. No other resource in life can sustain me and hold me up as the Lord can out of the riches of His mercy. Because of the unlimited blessings He gives, I will not fall. He never disappoints, taking care of all my needs. He promises that even in old age, I can stay fresh and green when I proclaim to others that the Lord is my upright and righteous Rock! (Psalm 92:14). I just may wear green today, but with this verse in mind. Thank you Lord, for keeping me fresh, green and thriving because of Your riches! There is nothing more annoying than having a speck of sand or dust in the eye. I saw a toddler at the beach screaming because of sand in one eye. The mother had to hurry over before he tried to rub it out with a sand encrusted hand! The best way to get rid of that nasty particle is with pure moving water. 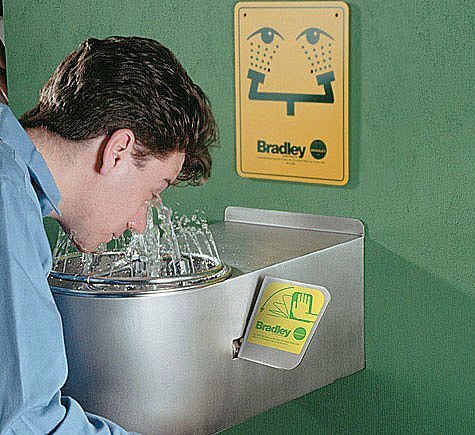 The eye wash station pictured here would be a good idea at every beach! Having a plank of wood in the eye is a horribly painful image! Yet, according to our verse for today, we are often guilty of trying to see around something this painful and obvious in our lives. I would not trust the sight of someone so unaware to help me with my speck, no matter how painful and annoying it may be! The context of this verse does allow helping others with a particular struggle with sin. But the one helping has to have good spiritual eyesight or he is disqualified from helping. The prerequisite to speck removal is pretty specific (Gal. 6:1-4). Only those who are walking by the Spirit should ever attempt it. The one who is pointing out a speck needs to be gentle and humble, and strong enough not to fall into the same temptation. Speck removal involves commitment to an ongoing relationship, helping to carry the other’s load. Why is it that I can spot the specks in another’s eye so readily? Amazing how I can see around and ignore my own nasty planks! Lord, keep me humble enough to continually check my own eyes before worrying about someone else! We had the privilege of living in the Loire Valley of France for three years. It is an area known for its fabulous châteaux. 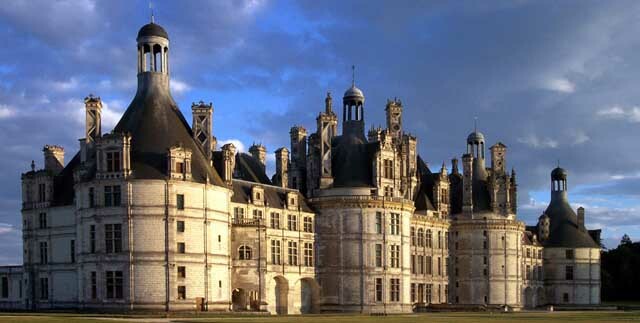 The Chambord is probably the most recognizable as it is six times the size of most. What is so amazing is the number of rooms. Although only eighty are open to public viewing, there are 440 in what started out as just a hunting lodge! I cannot even imagine having so many rooms! In our verse for today, rooms are being readied in preparation for the arrival of God’s children. Each is being especially prepared by our loving Father. The number of rooms in His house are too numerous to even be counted! Yet, I imagine that each one is stamped with the personality of the one who is to live there. The rooms will be perfect. The style will suit us. The comforts will be exactly right. But the best part is that there will be uninterrupted time with the Owner of the house. Categories: Comfort, Heaven, Hope, House | Permalink. How odd to see headphones on a dog! This one does not seem bothered wearing them. But I imagine getting him to obey one’s commands would be next to impossible! Of course, listening to our music has the added benefit of blocking out all unwanted noise. Teenagers wearing ear plugs can provoke all kinds of frustration for the parent. But I love being able to block out noise with them on a plane. It is great way to avoid listening to a loud conversation. Our verse today talks about listening as well. It is a phrase used only by Jesus and He said it eight times in the Gospels to get His listeners’ attention. He knows that we all suffer from “selective hearing.” There is a story about a bird’s song going totally unnoticed on a crowded city street. But the softer sound of some coins dropping on the pavement caused everyone to turn their heads. So it is with selective hearing. As a teenager I remember times I tried to avoid punishment from my parents by responding with, “But I did not hear you!” I think I have that attitude sometimes about what God’s Word tells me to do. I do not want to hear Him ask what is uncomfortable or difficult. But then I would not hear His whispers of love either. Lord, I really want to hear You. Please speak to me today. Categories: Dog Images, God's Word | Permalink.